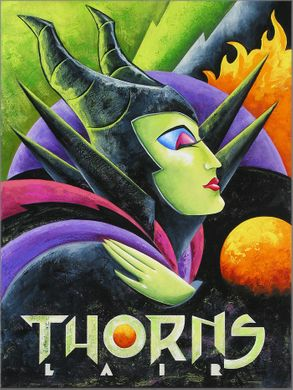 Mike Kungl Artist Signed and Numbered Limited Edition Canvas Giclee:"Thorns Lair"
About the Art: Edition Size: 195 numbered and hand signed by the artist. The Art of M Kungl - A Fresh Twist on a Classic Era. After completing art and design school M Kungl applied his graphic design education to achieve a successful career in advertising. Spending nearly two decades creating award winning logos, package design and illustration for companies such as Panasonic, Johnson & Johnson, Toshiba and Nissan Motors, Kungl then focused on fine art full time. The Miami honor is just one of many in a succession of developments that highlight Kungls growing reputation as a recognized collectible artist across the country and around the world. In addition to strong domestic sales of his images, Kungls works are rising in popularity throughout Europe, Japan and Australia. His work is featured regularly in magazine articles, how to books and television shows.